Additional partners including IBM, Deloitte, Nod Labs, and Plantronics have also registered to participate. Set to begin on June 6 in San Francisco, California, the Wearable World Invents Series will combine a spectrum of developers with leading hardware manufacturers in the wearable space to create new technologies for trial on American Airlines. After an initial pitch and development weekend, teams will have 30 days to develop a prototype of their technology before testing out their systems on a transcontinental American Airlines flight from New York City to San Francisco. 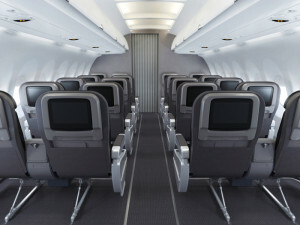 The in-flight test, which will take place on a new American Airlines Airbus A321 Transcontinental (A321T), featuring three classes of service, individual AC power outlets and USB jacks available at every seat throughout the aircraft as well as Gogo’s upgraded ATG-4 Wi-Fi service, will showcase the next generation of wearable technology. Winners of the competition will be awarded space in the Wearable World Labs program incubator space in San Francisco as well as the opportunity to partner with American Airlines on product development. Developers interested in participating can register interest at bit.ly/wwinvent. Extremely innovative app idea by American Airlines. Truly one of a kind.